The types of mosquitoes that carry Zika virus are not native to anywhere in the United States, but over the years have established presences in areas of Los Angeles County, public health and vector control officials confirm. Their goal is to minimize any possibility the county mosquito population here could become infected, as has already happened the past year in much of Latin America and the Caribbean. Currently during California's cooler winter months adult mosquito activity and breeding are minimal. A clearer picture could emerge at the onset of spring, when mosquito activity picks up and vector control districts can trap mosquitoes for testing. Once limited to the tropics between Asia and Africa, Zika in recent years has spread along the equator to the Western Hemisphere. A travel warning issued by the Centers for Disease Control identifies 22 destinations as places where the Zika virus is present. To date in the United States, the only known cases were acquired during travel to a number of those destinations. The mosquitoes believed to carry Zika are members of the Aedes genus: Aegypti, which first appeared in LA County decades ago, and Albopictus, which reappeared in the San Gabriel Valley city of El Monte in 2011. Aedes albopictus — commonly known as the "Asian Tiger" with distinctive black and white appendages — has been doubling its territory every year since then, according to Kenn Fujioka, manager of the San Gabriel Valley Mosquito and Vector Control District. The concern in Southern California is that a traveler returning with the virus could be bitten by an Aedes mosquito, and that infected mosquito could then transmit Zika to other people, and the disease could become established here. 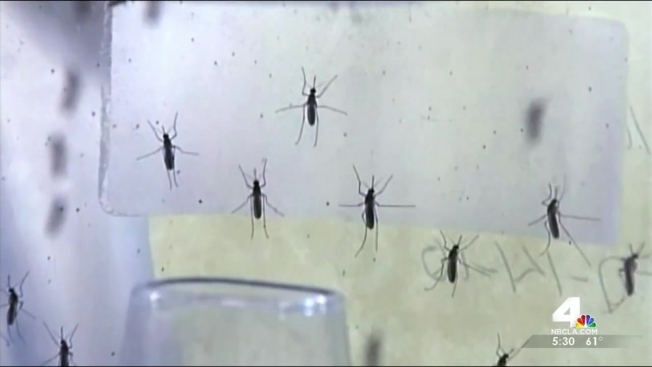 "It just adds to the level of concern for this mosquito, and another reason to control it," Fujioka said. Unlike the native mosquito population which is most active at dawn and dusk, Aedes mosquitoes will look for food and bite throughout the day. That alone brought it disdain in LA County backyards, even before the specter of Zika virus approached the Americas. In the first confirmed Zika case in Los Angeles County, a teenage girl came back from a trip to El Salvador, was reported Tuesday by Public Health. "She has recovered," according to a statement from LA County Health officials. The statement did not identify the area of LA county where she lives. "If someone does become ill, we want them to stay inside, away from the Aedes mosquito to make sure they don't cause a local infection to occur," Ben Schwartz, MD, deputy director of the acute communicable diseases control program for Los Angeles County Public Health, said during an interview Friday. The symptoms of Zika are described as "cold-like" and often mild in adults. Four out of five do not realize they have been infected, according to the CDC. The greater concern is for babies born to mothers infected during their pregnancy. Zika is suspected of causing microcephaly, a debilitating birth defect in which the brain and skull do not develop fully. In Brazil, the incidence of microcephaly has increased markedly with the spread of Zika infections. A child born in Hawaii with microcephaly tested positive for Zika. On Tuesday, the CDC issued specific guidelines for physicians responsible for the care of expectant mothers, including indicators for ultrasound testing to identify microcephaly. Aedes mosquitoes also can carry other dreaded tropical diseases, dengue fever and chikungunya, that are related to Zika. It is perhaps small consolation that Aedes mosquitoes do not carry West Nile virus, the disease that for years has been California's most serious mosquito-borne illness. West Nile is transmitted by the native Culex mosquito, and officials say that is reason enough for Southern Californians to be vigilant in eliminating the small pools of stagnant water where mosquitoes breed. Stamping out the breeding grounds of the Albopictus can be even more difficult because it is able to breed in as little water as might fill a bottle cap, said Fujioka. "People have to patrol their residences, and make sure these sources are not there," said Fujioka. If Zika infection is identified in LA County, Fujioka expects the response to involve community education, an intense effort to eliminate potential breeding grounds in the area, and possibly also pesticide spraying. The kind of broad scale aerial spraying that has been used in previous decades for invasive fly pests is not well suited to mosquito eradication, Fujioka said, and he would not expect to see that done for Aedes mosquitoes — even if the local population were to become infected.